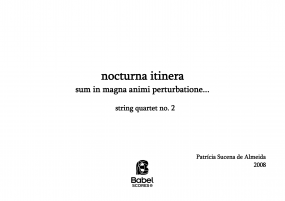 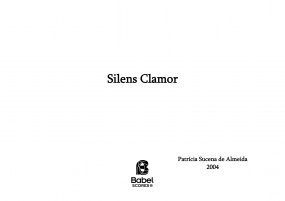 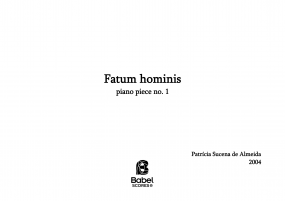 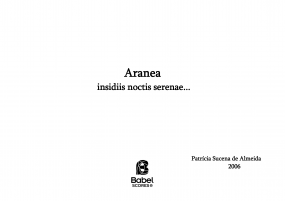 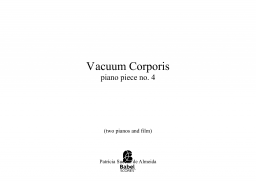 Patrícia Sucena de Almeida (1972) studied Electroacoustic Music and Composition with the Portuguese composer Joao Pedro Oliveira at the University of Aveiro (Portugal) and in 1997 she finished her degree in Music Teaching. 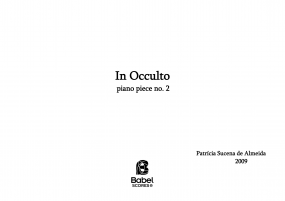 In 1998 she graduated with a master’s degree in Composition from Edinburgh's University, as a scholarship student of “Fundacao Para a Ciencia e a Tecnologia do Ministerio da Educacao - Portugal, no ambito do 2o Quadro Comunitario de Apoio”. 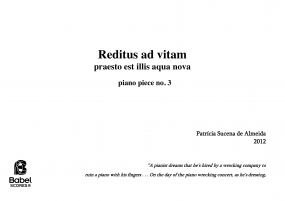 That same year she started a doctorate program (still as a scholarship student) in Composition at City University of London and in 2000 she continued her composition studies at Southampton University with the British composer Michael Finnissy, finishing her PhD in 2004. 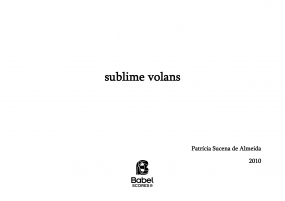 Her portfolio includes some of the following pieces: Solitudo (1999) (performed at “The International Gaudeamus Music Week 2001”, Amsterdam): Argumentum (2001)(performed at “Porto 2001 - Capital Europeia da Cultura”): Transfiguratio (2002) (worked out during the workshop of “Cours du Centre Acanthes 2002”, Villeneuve-les-Avignon): Mens Sana in Corpore Sano (2003/2005) (orchestral version performed at the III Gulbenkian’s workshop for Portuguese Young Composers, Lisbon, 2004): Monstrum Horrendum (2003/2004) (orchestral version performed at the II Gulbenkian’s workshop for Portuguese Young Composers, Lisbon, 2003): Fatum Hominis (2005) (selected for the “ISCM world Music Days/23rd Music Biennale Zagreb 2005”, and performed at “Ny Musikk 2005”, Oslo): Silens Clamor (2004) (commissioned by the Conservatoire National Supérieur de Musique et Danse de Lyon for the “Académie de Chambre Contemporaine Jeunesse Moderne 2004”, performed at "Musica 2007", Strasbourg, and at "Futuros 1.2", Lisbon, 2008): Dulce Delirium (2005) (performed by the Arditti Quartet at the “Centre Acanthes 2005”, Metz, at the "Atlantic Waves 2006", London, at the "Festival Internacional de Aveiro and Lisbon, 2007): Fati Necessitas (2005) (commissioned and performed by the Contemporary Music Ensemble of Lisbon, Matosinhos, 2006, and at the "IX Semana Cultural da Universidade de Coimbra”, 2007): Aranea (2006) (commissioned and performed at the “Festival Música Viva 2006”, Lisbon, and at the "XXVI Festival de Música de Leiria", 2008): Nocturna Itinera (2008) (performed at the "44th International Summer Courses for New Music", Darmstadt, 2008, and at the "2nd Blonay Workshop for Contemporary Quartet Music 2008"): In Occulto (2009) (performed at "Ciclos de Concertos Momentum”, Aveiro, 2009, at the "New Music Festival (Transit 2009)", Leuven, 2009 and at the "Concert Series", City University, London, 2010): Sublime Volans (2010) (performed at the "25o aniversário da Miso Music Portugal", Instituto Franco-Portugués, Lisbon, 2010, at the "Fórum Internacional Jovens Compositores", Goethe-Institut, Lisbon, 2011, at the Korea Foundation – Cultural Center Gallery, 2011, and at "Guimara?es Capital Europeia da Cultura 2012"): Reditus ad vitam (2012) (performed at “Do Virtuosismo pianístico de Liszt à multi(n)disciplina do século XXI”, Coimbra, 2013). 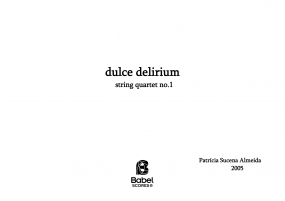 She has participated at the “IRCAM`s Académies d’éte?, the “40th Internationalen Ferenkursen fur Neue Musik – 2000 and 2007” in Darmstadt: the “Cours du Centre Acanthes 2002 and 2003 at the Chartreuse de Villeneuve les-Avignon and 2004 and 2005 in Metz: the I, II, III and IV Gulbenkian's Workshop for Portuguese Young Composers and a number of other seminars and workshops with composers such as Emmanuel Nunes, Jonathan Harvey, Luca Francesconi, Hilda Paredes, Gérard Grisey, Brian Ferneyhough, Pascal Dusapin, Luc Brewaeys: experimental workshops and concerts with the Arditti Quartet, the pianist Ian Pace,Yutaka Oya and Filip Fak, Orquestra Gulbenkian, Grupo de Música Contemporánea de Lisboa, Orchestre lyrique de Région Avignon – Provence, L'Ensemble Itinéraire, Sond'Ar-te Electric Ensemble, Remix Ensemble, OrchestrUtopica, Ensemble Studio New Music: and conductors like Sylvio Gualda, Sarah Ioannides, Igor Dronov, Christopher Bochmann, Guillaume Bourgogne, Pedro Neves, Pedro Amaral.